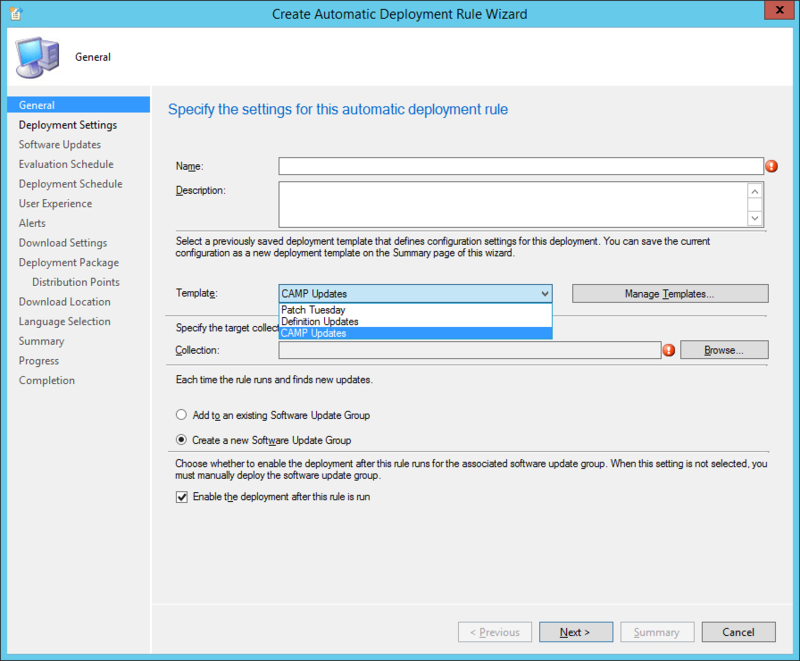 As per the limitations listed, the only option during the installation is for a Primary Site. 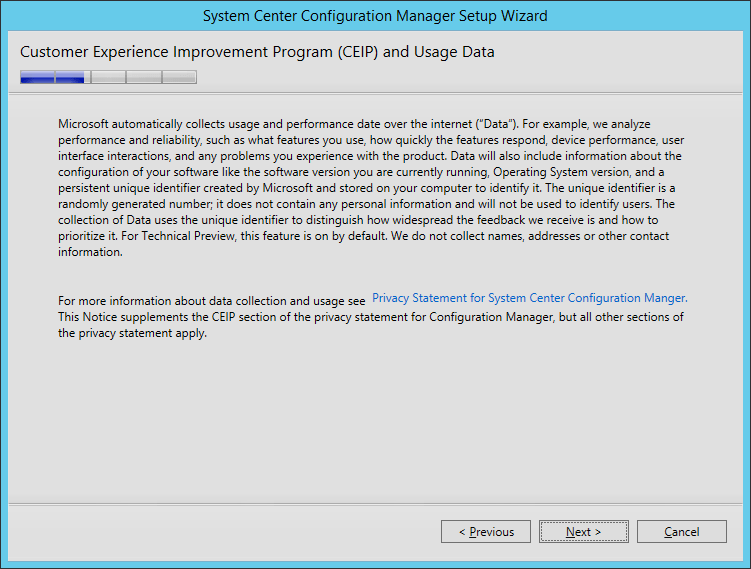 Going through the installation, I noticed that the CEIP program page is different (compared to the SCCM 2012 R2 installation), and no longer provides the option to “opt in” or “opt out”. 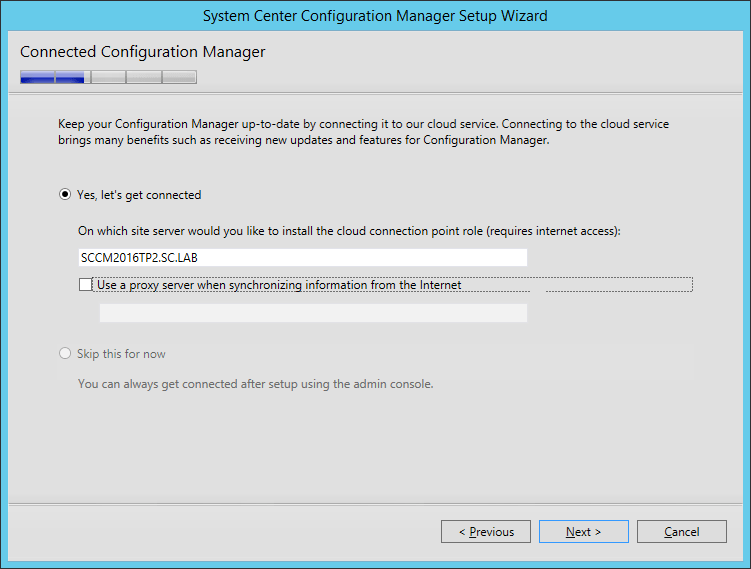 There is now also a new option to connect SCCM to Microsoft’s cloud service to keep it up-to-date. It will be interesting how this will work, and if we will get a prompt/option for the update, or if it will be forced upon us. When the installer runs the Prerequisites Check, it is interesting that the Technical Preview 2 is still referencing/leveraging the Windows Assessment and Deployment Kit (ADK) for Windows 8.1, and not Windows 10 (even if it is only still in preview). 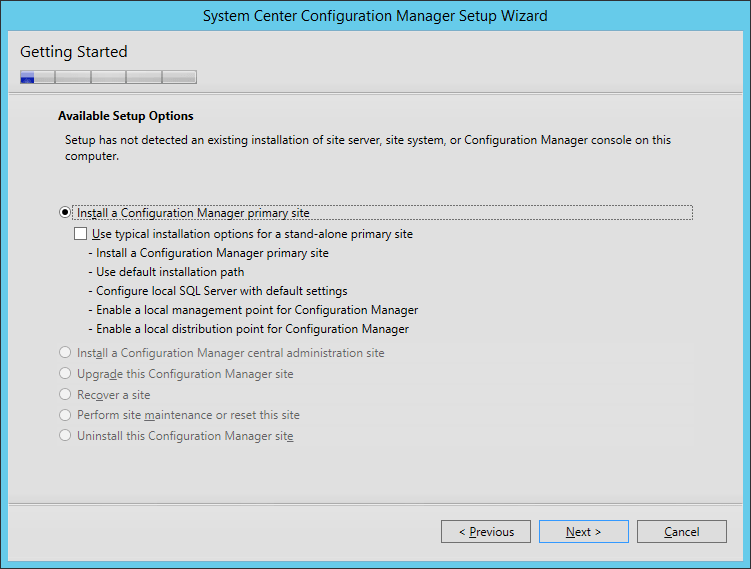 In addition to the features contained within the “R2 SP1” release (see my article here: First Look At System Center Configuration Manager 2012 R2 Service Pack 1), there are some additional features now included. 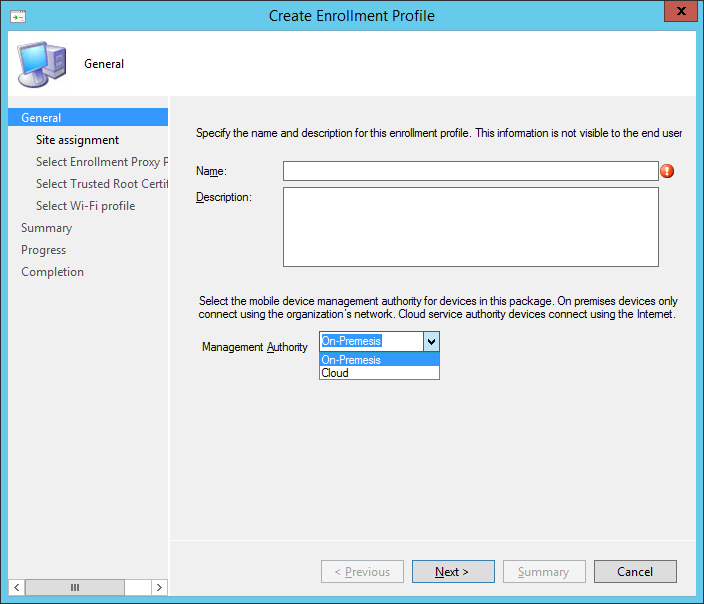 In Service Pack 1 for SCCM 2012 R2 release, there is already the options for iOS devices. 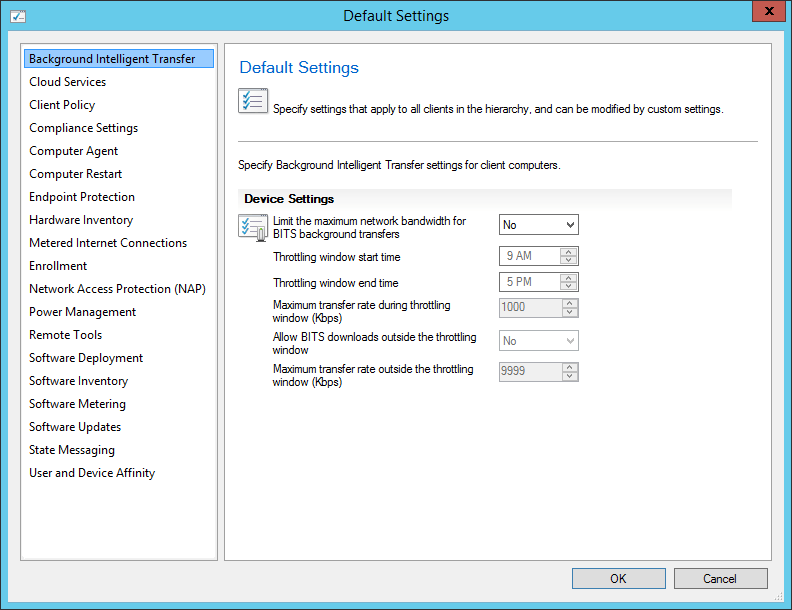 Now in SCCM 2016 Technical Preview 2, we have the added option for Windows devices. On the General screen, we have the option to choose the Management Authority between “On-Premesis” (which is spelt wrong), and “Cloud”. 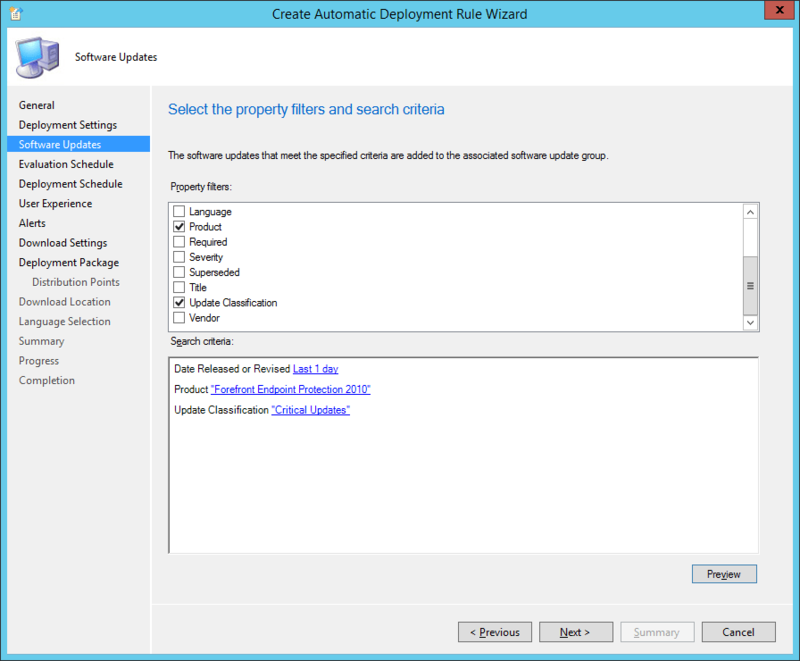 Although ADRs are not a new feature/addition, there is a new Template to select aside from the “Patch Tuesday” and “Definition Updates” options; called “CAMP Updates“. 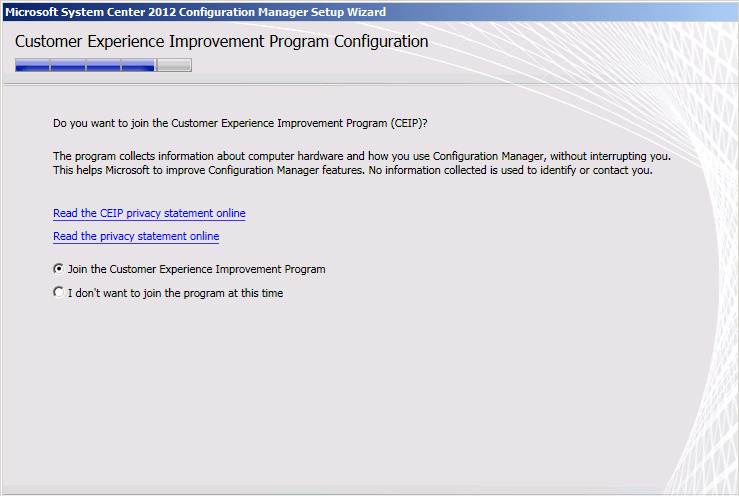 With the ‘CAMP Updates’ template selected, the default Software Updates are set to “Forefront Endpoint Protection 2010” and “Critical Updates”. 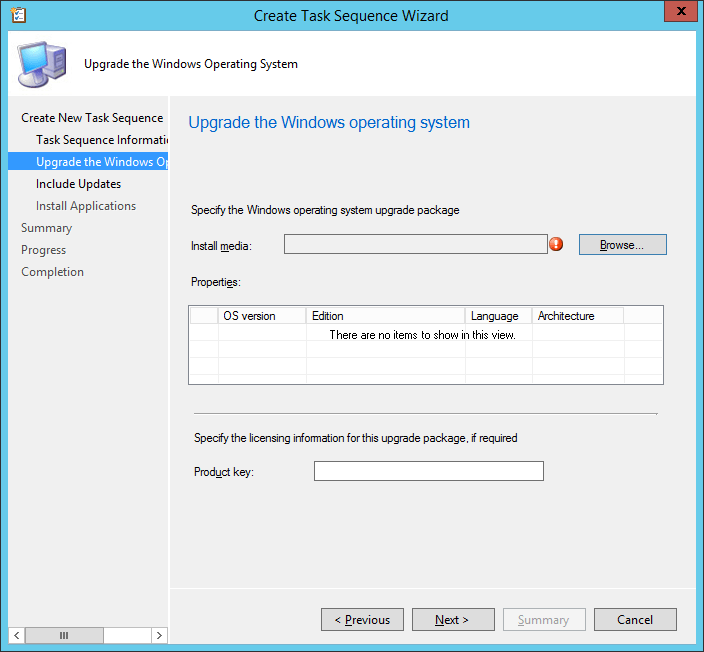 Within the Task Sequences area, there is a new option to choose from compared to SCCM 2012 R2 SP1, “Upgrade an operating system from upgrade package“. This new Task Sequence provides the option to, obviously, perform an OS upgrade (think Windows 7/8.1 to Windows 10). Nice. There are 2 new items within the Client Status area, “Production Client Deployment” and “Pre-Production Client Deployment“. 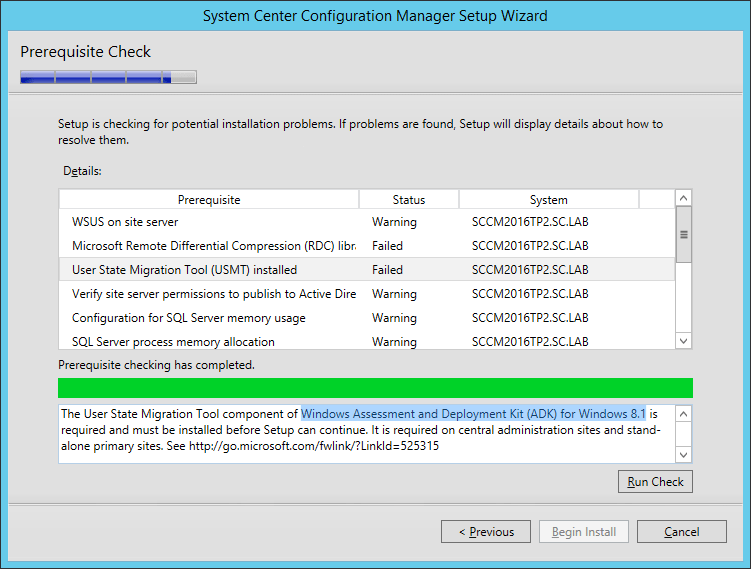 Within the Administration workspace, within the Cloud Services section, there is an area for Update And Servicing/Features, which logically is connected to the new installation option of connecting to Microsoft’s Cloud Service for updates and new features to SCCM itself. Hopefully this will list the new features, updates, etc. and provide the option of when and where to install them. 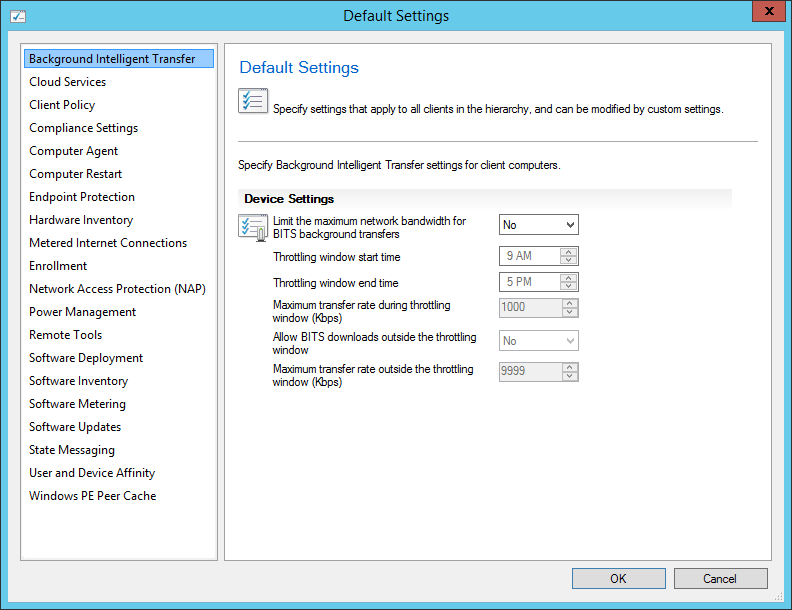 There are also some new features within Client Settings compared to the SCCM 2012 R2 SP1 release. 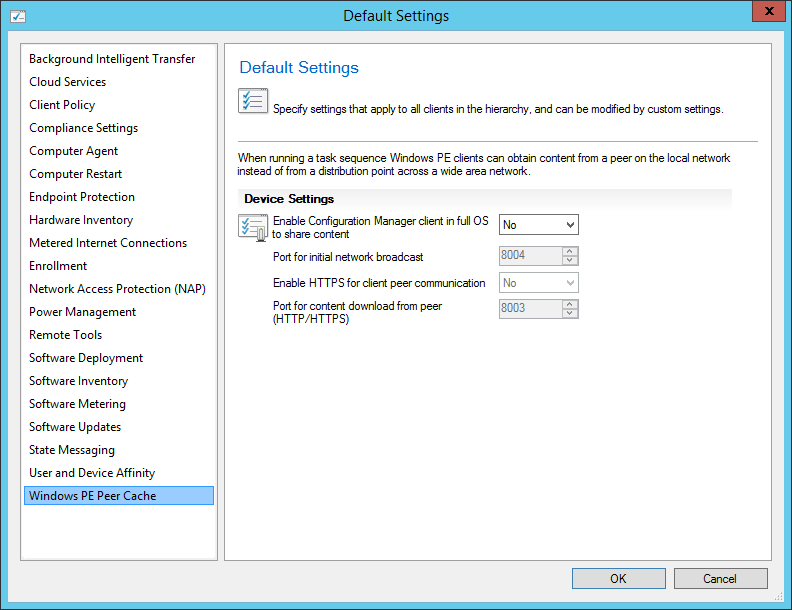 The new “Windows PE Peer Cache” client settings option, will be really useful especially with OSD. 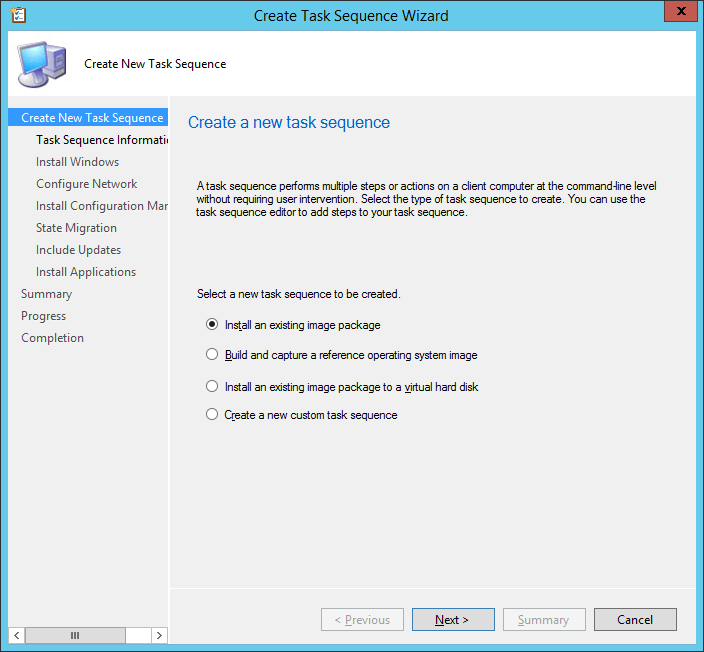 Per the TechNet aritcle: “When you deploy a new operating system, computers that run the task sequence can use Windows PE Peer Cache (a new capability in Configuration Manager) to obtain content from a local peer (a peer cache source) instead of downloading content from a distribution point. This helps minimize wide area network (WAN) traffic in branch office scenarios where there is no local distribution point. That covers some of the apparent changes. I’m sure there are a bunch of “under the hood” stuff that I haven’t explored yet. But at least this gets your started.